Discussion in 'The Church Forum' started by CoreIssue, Dec 6, 2018. True Catholics say they are the only church. I am of the group that says there are Protestants, Catholics and nondenominational. Strange thing is Catholics say they don't have divisions, just some difference in the rites the practice. Which is baloney. 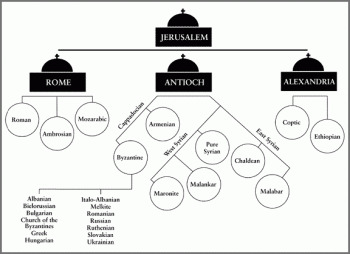 No one can say that Roman Catholicism and Orthodox have more differences than that. In fact, the divisions in Catholicism go even deeper. And to say those differences do not meet the definition of denominations is not being honest. When did the clergy of the RCC claim that honesty was a virtue? I see your complete obsession with - and total ignorance of the Catholic Church continues. Time for a little lesson . . .
- The Catholic Church is NOT called the “Roman Catholic Church”. The official name is "The Catholic Church,"
- “Roman Catholicism” refers to one of TWENTY Rites. - ALL of these 20 Rites are in FULL communion with each other. The differences are largely regional ethnic customs and liturgical practices – NOT doctrinal. As for YOU and your “non-denominational” status – you are a PROTESTANT. ALL Christians who are neither Catholic nor Orthodox fall under the Protestant umbrella by definition. Protestants follow the tenets invented and introduced at the Protestant Revolt of the 16th century such as Sola Scriptura and Sola Fide. There ends the lesson for now . . . I don't care what you want to officially call it. The fact is you follow the Roman teachings of Catholicism. Not the Orthodox teachings. And contrary to what you say, of the various rights, only that of Rome recognizes the Pope in example. And no, not being Catholic does not make me Protestant. We don't even agree on Catholicism being Christian. I follow the Bible, try to get that through your head. Bible only is taught in the Bible, Catholicism is not. Nancy and Willie T like this. Your ignorance continues . . .
First of all – ALL TWENTY Rites of the Catholic Church recognize the Bishop of Rome as the Pope. That’s part of what being in “full communion” means, Einstein. Secondly – ALL NON-Catholic or NON-Orthodox Christians are PROTESTANT, by definition. As I stated before - the fact that you cling to the 2 main pillars of Protestantism invented at the Protestant Revolt – Sola Scriptura and Sola Fide are evidence of this. Finally – YOUR claim that the Bible teaches “Bible Only” is absolute anti-Biblical nonsense. I openly challenge you to provide me with the Scriptural evidence for Sola Scriptura. First of all – ALL TWENTY Rites of the Catholic Church recognize the Bishop of Rome as the Pope. Of course. I readily acknowledge this. I have a friend who is a Byzantine Rite Catholic and there's a lot I admire about her faith and traditions. On this I'm going to disagree with you. There are non-Catholics and non-Orthodox out there who back do at least one of follow 1) do not trace their theological roots to the Protestant Reformation, 2) do not hold to Sola Scriptura, and/or 3) do not hold to Sola Fide as taught by the Protestant reformers. “As taught by the Protestant reformers”. In other words – they simply splintered from the Protestant Fathers. This is COMMON. ALL good Protestants MUST splinter. This is the fruit of Protestantism – perpetual-splintering. Make NO mistake, however – they ALL trace their roots back to the 16th century . . .
3)Or Protestant in one of those three criteria. There is an "4) other" category. However - we are talking about CHRISTIANS. ALL others are quasi-Christian sects - Mormons, Jehovah's Witnesses, Oneness Pentecostals, Unitarians, etc. A Christian by definition is a Trinitarian. I didn't make up that rule - CHRIST did (Matt. 28:19). Totally disagree with you on every point here. 1. Salvation is by faith grace and repentance Lord Jesus Christ. 2. Forgiveness of sin is only by Jesus Christ be the Holy Spirit. Catholicism teaches grace through works. Grace means gift yet Catholicism believes you have to earn it. Talk about a contradiction. Catholicism believes a priest can forgive sins. A pure violation. Catholics pray to Mary Catholics saints. So Catholicism is not Christian anymore than the others in your list. You can disagree until the cows come home - but a fact is a fact. THE basic tenet of Christianity is belief in the Triune Godhead. Anything else is something other than Christianity. You're obviously not interested in talking to people whom have other views, so I won't belabor the point here. You have worn that line out using it so many times. He is right that Christian are Trinitarian's. Mormons are polytheist. This is yet another example of your abject ignorance of ALL things Catholic. First of all - salvation is by grace through the Blood of Christ. GOD forgives sins. And, since Jesus IS God - He transferred that power to His Apostles and their successors. Three times in the Gospels (Matt. 16:19, 18:18 and John 20:23), we read where Jesus gave the Apostles the power to forgive sins or to hold them bound. This is NOT something that Jesus took lightly. (Jesus) said to them again, "Peace be with you. As the Father has sent me, so I send you." And when he had said this, he breathed on them and said to them, "Receive the holy Spirit. Whose sins you forgive are forgiven them, and whose sins you retain are retained." The first is when he breathed life into Adam. The second is here in John’s Gospel when he is giving them the power to forgive or retain sins. Finally - Catholics ASK Mary and the saints in Heaven to pray FOR us. This is NO different than asking a fellow Christian here o earth to do the same thing. Those in Heaven are members of the Body of Christ - just like the Christians on earth. To "Pray" simply means to "ASK". In fact - "worship" is a SECONDARY definition . . .
Do your HOMEWORK before making any more embarrassing claims . . .
No Jane - it's just that I am only interested in facts. I don't care about opinions as much as I do facts - and the fact is that belief in anything other than the Triune Godhead is NOT Christian. Yes - we finally agree on something. Actually, there is only ONE type of Christian and that is a person who has repented, been baptised (by immersion) and received the gift of the Holy Spirit. If this has not happened to you then you are not a Christian regardless of what denomination or outfit you claim to be part of. Heart2Soul and Jane_Doe22 like this. While Full immersion Baptism was the preferred method of Baptism in the Early Church, Scripture is completely SILENT on this matter. There is not ONE verse that describes an actual Baptism. We learn about the details of Baptism from Apostolic Tradition. And concerning baptism, baptize this way: Having first said all these things, baptize into the name of the Father, and of the Son, and of the Holy Spirit, (Matthew 28:19) in living water. But if you have not living water, baptize into other water; and if you can not in cold, in warm. But if you have not either, pour out water thrice upon the head into the name of Father and Son and Holy Spirit. You re correct about the indwelling the Holy Spirit. Jesus describes thus regenerative aspect of Baptism in John 3:5. Before the East-West Split in the 11th century – there was ONLY the Catholic Church. Then, in the 16th century, Protestantism spawned the perpetual splintering of tens of thousands of disjointed sects ALL teaching different doctrines and ALL claiming they were “led” by the Holy Spirit. This isn’t my opinion – it is simply a fact of history . . . It is true.....the doctrine of the Trinity is the historic dividing line between orthodoxy and heresy. Dave L and Marymog like this.